In the land of Gods, the arrival of a vigilante stormed the silence. He was brutally used and harassed by Gods. His emotions and sentiments were toyed with. The most powerful god, Agusthus, feels crippled before him. He targets everyone responsible for his state. He drains Agusthus by slaughtering his son. He exhausts Moira, daughter of Agusthus, by killing her brother before her eyes. He breaks Castle Gray, the only one capable of stopping him, by cursing his love into a cold bloodless stone. He weakens the powerful Queen Iris, Gray's mother, and enslaves her husband. He certainly has no opponent. 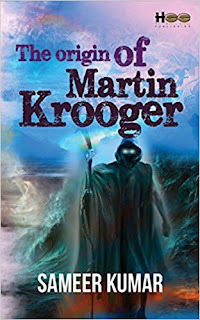 The origin of Martin Krooger is the first book in this series and it has done quite a lot of justice to the name and mystery is creates by its first look. The dark cover, the mysterious blurb and an amazing title, the book has it all. 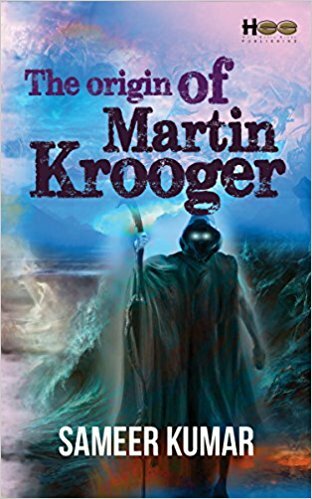 When I think about this book I feel really connected to it in one way or the other. Every aspect of the book is written in a wonderful way, it surely attract you towards it from the very first page. The main highlight was the characters. It was all really gothic and mythological but not in an absurd way mind you, it was a light show with a very edgy topic. I loved the supporting characters, the main leads, everybody, I loved everybody, from Andrew to Queen Iris, from Moira to Agusthus and I loved Castle Gray. I enjoyed everyone at large. And this was mainly because everyone was so different from each other that every time a new character came in view, it was a treat. My favorite was Eli. In every character there was a different spark, a different attitude which was attractive beyond limits. I loved Adam, I simply loved him. He was this darkest of all, mysterious and full of rage, it was so nice to hear him, his part, his pain and his version of the tale. His words could move the mountains, so much of grief and sadness. It was mind-blowing. The problem was in the untimely and unannounced change in the course of action. At one time I am reading the part of a group of friends and suddenly the story changes to the serious discussions between Agusthus and Marion. The author should have separated these two things by a certain symbol so that I could have prepared myself for such change in the tale. It became a little disoriented for me. Also the overall narration was a bit not great. Queen Iris was narrating a tale and I didn’t get to know when that ended. Many different parts came in the tale and I just lost the track. A little more specific narration was needed. Now coming on the story, the starting was amazing. The whole idea of Eva and the Gods was superb. It was penned well, with fine characterization. As the story was still emerging fully, the author was very subtle with it and a right amount of everything was there in the beginning. I loved the whole episode of Nirvana and the people living there; the whole decorations to the surroundings that the author did and the use of imagery to exaggerate its splendor. The story moved in the similar manner in the middle as well. There was a lot of suspense going on then and it didn’t get ruin anywhere, not even an inch was disturbed. Though the episodes of all the friends meeting was not jelling up with the main tale but it was nice break to see all of them enjoying a bit when a lot was going on in reality. They played a very important role in the end though. I loved the whole episode of Mary and Andrew visiting the underground. It was the main highlight of the book. Everything said, everything done in that course took my breath away. It was so dark and supernatural that due to that I am more excited to read what happens next in this series. I was concerned about the end at first because only few pages were left and the tale was nowhere close to ending but then all endings have a beautiful start. I hope the same happens here. If I talk about the writing quality then the author managed to pass a good bar. There were no hindrances or difficulties in understanding his point of view in the book. The vocabulary was fine, the editing was fine. All in all, the book was a really enjoyable read only if the printing could have been more eye-friendly I would have finished it a little sooner. Waiting for the next part. I can recommend this book to all fantasy readers who want to explore Indian authors’ books falling in this category. It is not a big book so those who want to read more books this year can give it a try too. You won’t be disappointed at the end. Sameer Kumar is a mechanical engineer from B.I.T Sindri. He works at Tata Steel as a management trainee. It took him nine years to research and complete his novel. Being a motivational speaker, he works silently for the betterment of the society. He is a tech savvy and loves to make gadgets with his friends.